The Seward County Saints had a lot stacked against them Wednesday night, but won at the buzzer. 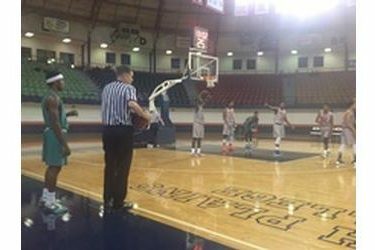 In a game played at the Texan Dome in Levelland, Texas, Seward out fouled fourth ranked South Plains 27-14, the Texans (34) shot twice as many free throws, and the Texans made their first six three pointers and led by 16 in the first half. But Seward rallied and when Niem Stevenson flicked a shot into the hoop at the buzzer, the Saints had an 81-79 win at SPC. The Texans came out smoking hot building leads of 16-6, 22-8, 25-10, and 46-30. The Saints finished the half on a 13-2 run and trailed just 48-43. Seward took their first lead 66-65 with 8:55 to play. SPC led 769 with 5:12 to play. SCCC tied the game at 76 with 2:21 to go. The Saints led 79-78 with 1:25 to play on a Marcus Mathieu three pointer. Seward fouled SPC who made one of two at the foul line. Seward missed a shot which SPC rebounded but the Saints stole the ball right back giving the Saints the ball in a 79-79 tie with the shot clock off. Niem Stevenson drove the lane and fed to the left wing to James Byrd for a left corner three which hit off the front of the rim Stevenson grabbed the rebound and finger rolled the ball in at the buzzer. Stevenson scored 30 while Marcus Mathieu had 19 and Delano Jones scored 18 on 6-8 shooting from three point range. The Saints were out rebounded by eight but held the Texans to 39 percent shooting and 33 percent in the second half. Seward is 7-0 and hosts Frank Phillips Friday and Midland Saturday at 8 both nights in the Billy’s/Days Inn Classic on 1270 and kscbnews.net. The Texans are 2-4.